Exodus 31:6b "and in the hearts of all who are skillful I have put skill..." I believe that God gives us all of our talents & gifts. And each person has a different set of them. Mine happen to be in the area of needlework. Please enjoy the talents & gifts God gave to me that I am blessed to be able to share with you!! 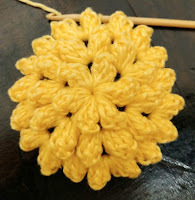 As I FRANTICALLY crochet and knit to finish up all of the projects on my Christmas gifting list, I am often inspired to create quick "last minute" items. 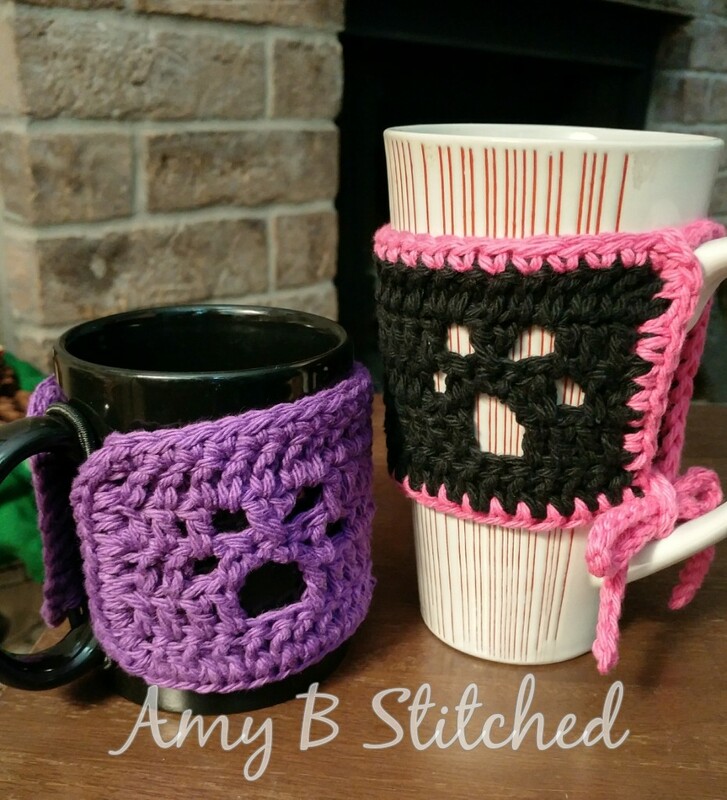 Ones that I can whip up in just a little bit of time and use yarn that is in my stash. 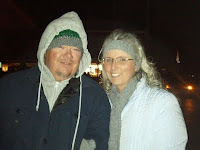 Last year was the Jar Topper Santa and Frosty hat's. Those were SO much fun for gifting last year. And my pups looked super cute in them as well. Want to take a look?? Click HERE and it will take you to that blog post. This year is another GREAT one...but it's from my most popular pattern line, the Meandering Paw Prints. There are options for two edgings. 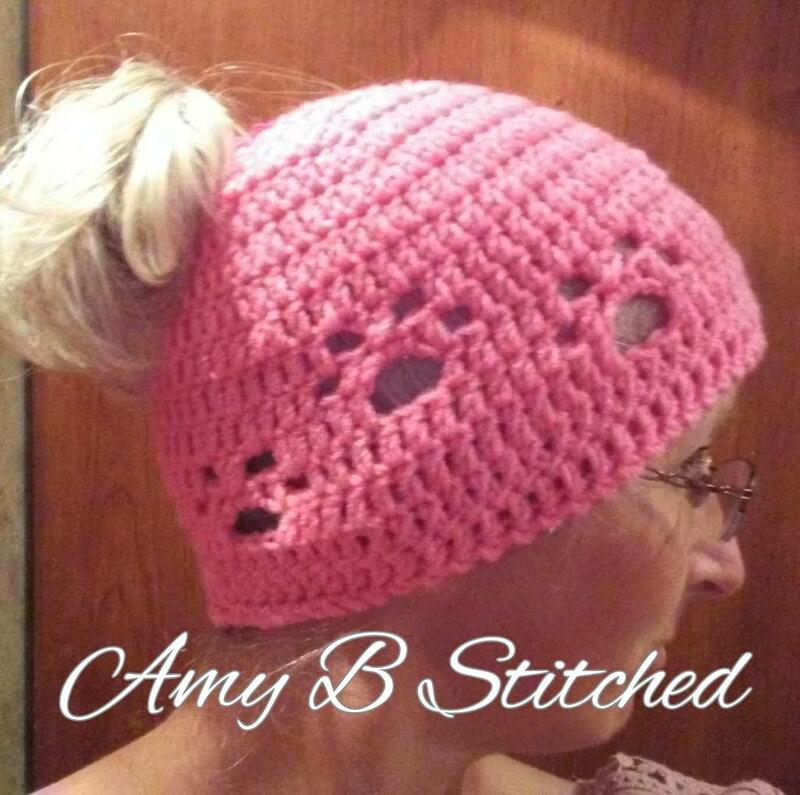 One that uses an Elastic Ponytail Holder and the other where you crochet ties for closing. I know the bottom tie seems a little off.....but I assure you, much though went into it. Last year I knit some mug cozies for friends that had the tie at the top. If adding your cozy is an afterthought to pouring your coffee, with the top tie you have to lift up a filled mug and risk spilling as you get your coffee mug "dressed". 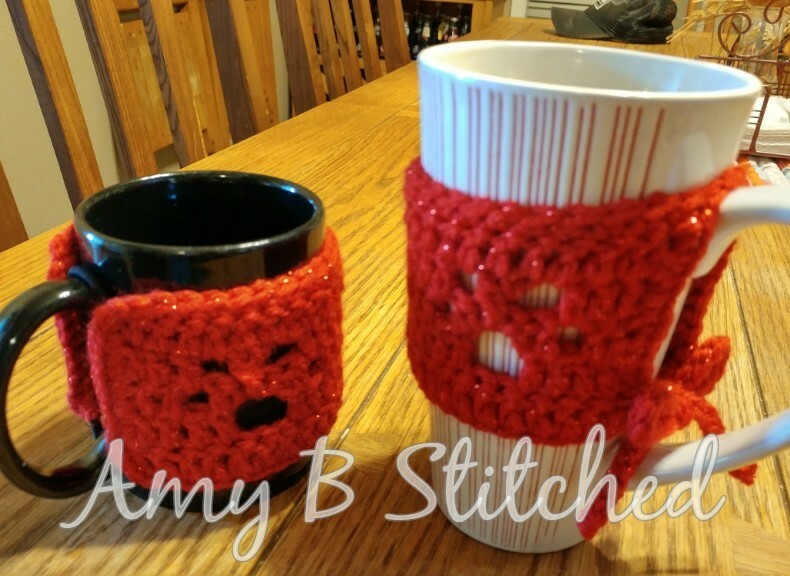 With the bottom tie you simply slip it over the top of your mug that is sitting securely on your table top. Also, no worries about the end of the tie ending up in your drink. 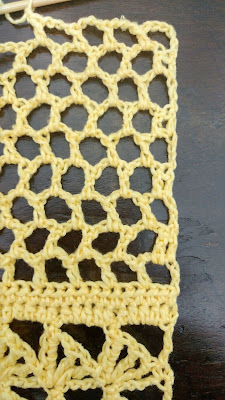 So without further ado.....I introduce the newest pattern. "MEANDERING PAW PRINTS MUG COZY"
Remember....I am a human and sometimes make mistakes!! 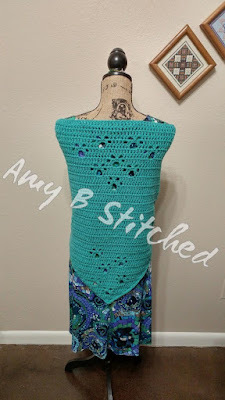 If you find an error with my pattern, please let me know in the comment section and I will try to correct it as soon as possible!!! If you are having difficulty with my pattern, the best way to contact me for help is through my Amy B Stitched Facebook page. A lot of hard work goes into writing patterns. 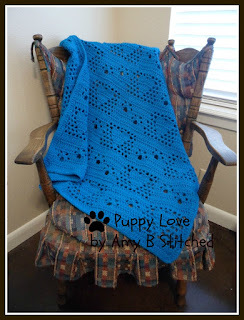 Please feel free to share the link, but do not copy and distribute this pattern by any other means. 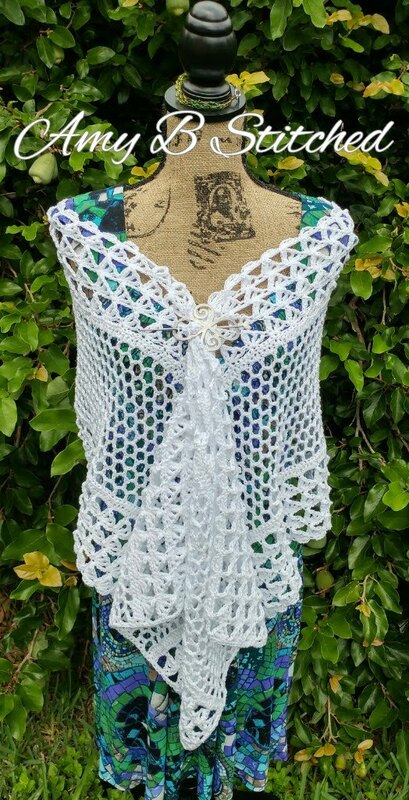 If you like getting my FREE patterns and don't want to miss out on any future ones, you can subscribe to my blog and have all of my new entries delivered straight to your email inbox! Just type your email address into the field on the right hand column under the heading "follow by email" and click submit. Be sure to check your email (sometimes it will end up in your junk/spam folder) and follow the verification steps for your subscription to be complete!! SIZE: Fits standard coffee mug. 3 ¼” tall x 9” long, excluding ties in edging option #2. MATERIALS: Size G/6/4.0 mm crochet hook, Worsted weight/medium/size 4 yarn (approx. 25-30 yds/14 grams/0.5 ounces), Elastic Ponytail Holder for Edging option #1, scissors, and yarn needle. GAUGE: Addressed at the end of Row 1. 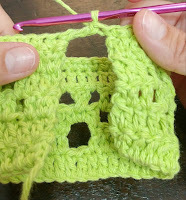 1) Ch 2 at the beginning of each row DOES NOT count as a stitch. 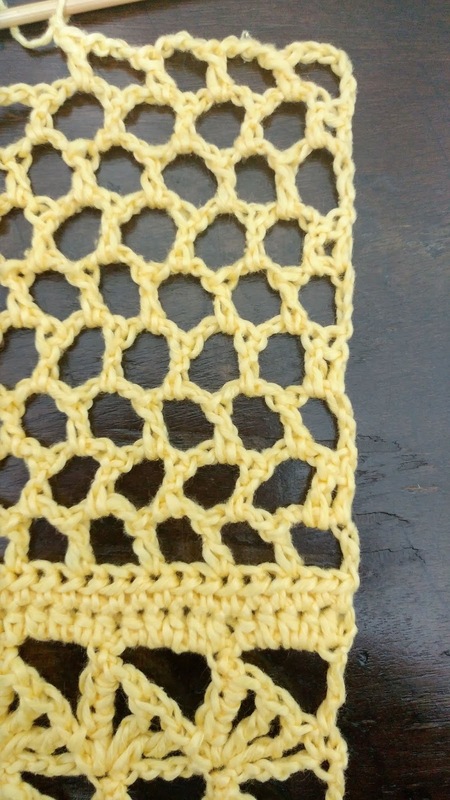 2) To help keep track of your stitches, the row stitch counts are in parenthesis at the end of each row. 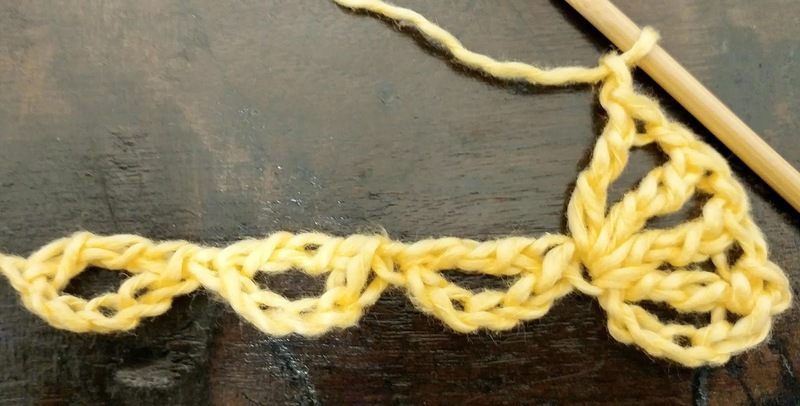 Chains are counted as individual stitches, except where you are instructed to “2 sc in ch 4 sp” then the entire ch sp is counted as one and you will work into the next stitch following the ch 4 sp. 3) 2DcCl: YO, insert hook into st, YO, draw up a loop, YO, draw through 2 loops. YO, insert hook into same st, YO, draw up a loop, YO, draw through 2 loops, YO, draw through last 3 loops. 4) Dc in last sk st: Insert the hook into the skipped stitch indicated and continue with your dc in the same manner as the other dc. This binds the two sts together into a cross stitch. 5) If you find yourself having difficulty with this pattern, please contact me via private message on my Amy B Stitched Facebook page. It is the quickest way to reach me and I am always happy to help. 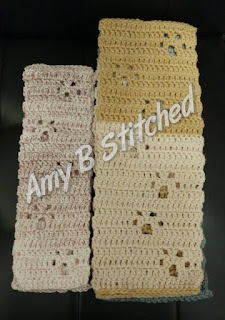 Please be ready to provide pictures of your work so I can help you determine the source of your problem quicker and get you back to stitching up your project. Row 1: Ch 32, dc in 3rd ch from hook and in each st across to last st. 2DcCl in last st. (29 dc, 1 2DcCl). Piece should measure approx. 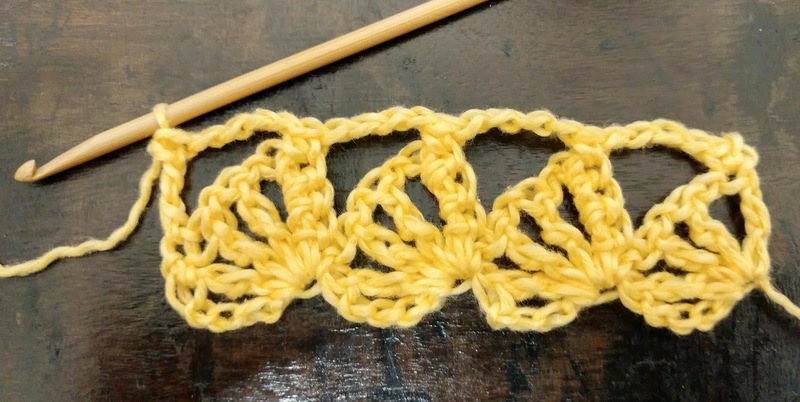 8 ¼” long x ¾” high at the end of this row. 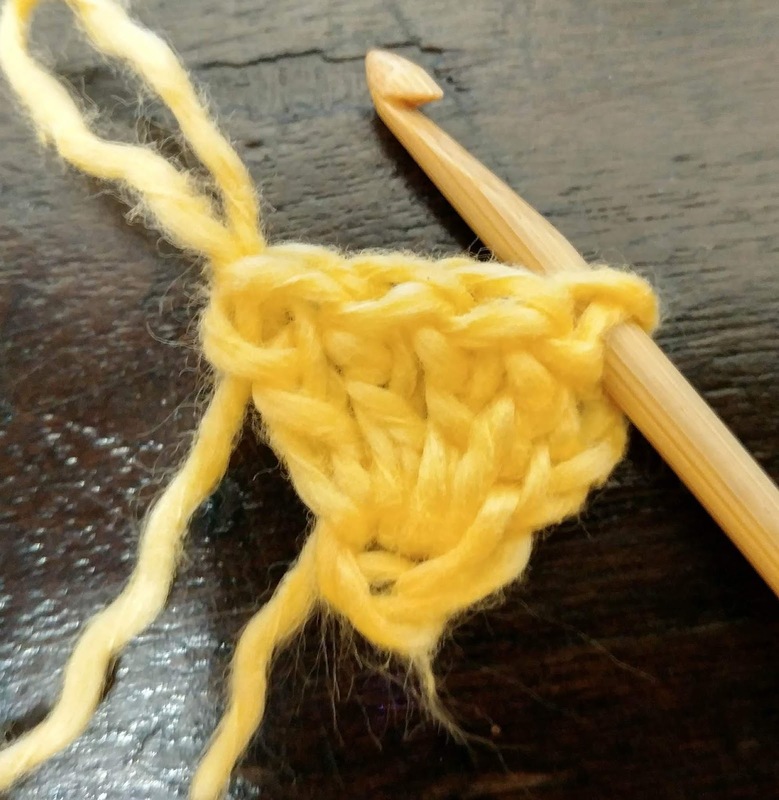 If size is significantly different you should choose a larger or smaller crochet hook to accommodate your need. 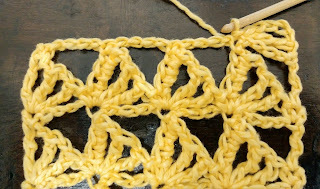 Row 4: Ch 2, turn. Dc first 3 sts. * Ch 1, sk 2, dc in next st, dc last sk st, ch 1, sk 1, dc in next 6 sts. Repeat from * one more time. Ch 1, sk 2, dc next st, dc last sk st, ch 1, sk 1, dc next 2 sts. 2DcCl in last st. (23 dc, 6 ch 1 sps, 1 2DcCl). Row 5: Ch 2, turn. Dc across to last st. 2DcCl in last st. (29 dc, 1 2DcCl). Do NOT finish off, but continue on to your edging of choice. Top: Ch 1, turn. Sc across. First side: Ch 1, rotate to work down side. Sc in top of first row. (See figure 1) Holding elastic ponytail holder behind work, sc evenly down side to last st working over elastic ponytail holder. Sc in last st.
Bottom: Ch 1, rotate work to stitch across bottom. Sc into the bottom of each dc across (do not stitch into the loop from beginning chain, but insert hook between the two parallel strands at the base of each individual dc). Second Side: Ch 1, rotate to work up side. Sc in top base of first row. Holding elastic hair tie behind work, sc evenly up side to last st working over elastic ponytail holder. Sc in last st. Sl st in first sc to join. Finish off. Top: Ch 1, turn. Sc in each st across. 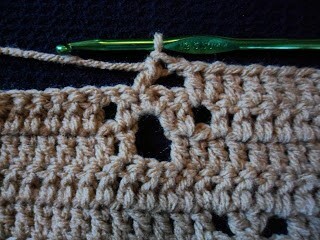 Trc in very first sc of edging row to join the top edge. See figure 2. First Side: Working down the side from the top edge of the trc, sc evenly across. Ch 26, sl st in 2nd ch from hook and in each chain across. Bottom: Sc evenly across the bottom (do not stitch into the loop from beginning chain, but insert hook between the two parallel strands at the base of each individual dc). Second Side: Ch 26, sl st in 2nd ch from hook and into each ch across. Rotate work and sc up the remaining side. Sl st into the base of the joining trc. Finish off. HOWDY Y'ALL!!! 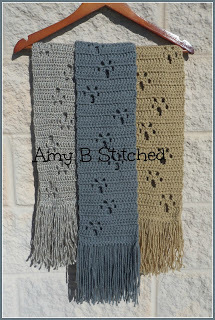 I did not realize until just recently, that many people only know of the ORIGINAL Meandering Paw Prints scarf pattern. 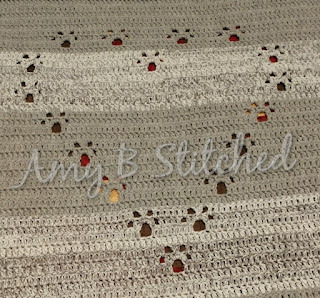 To date, I have designed 10 different patterns incorporating the Paw Print, 3 of which I have collaborated with other designers and there is also a video tutorial to help you with the stitch placement of the paw print!! 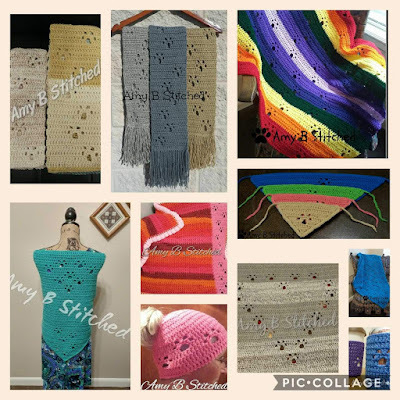 So to help you locate and SHARE all of these patterns from one page I have put together this Pattern Round-Up.....pretty easy since they are all my own patterns, but here you go!! 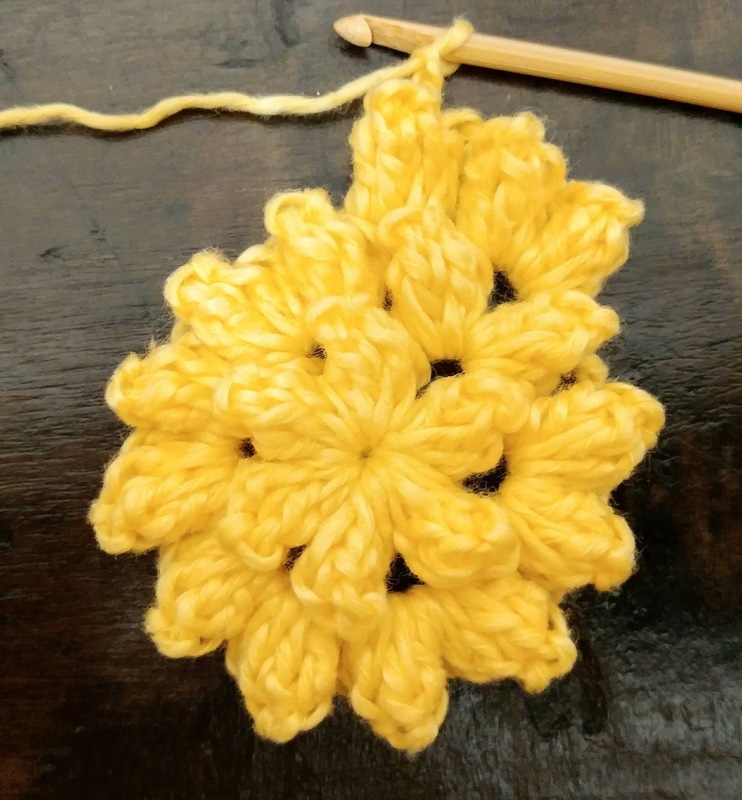 And if you would, please take a moment and add a comment here about which one of these patterns is your FAVORITE pattern. I'd love to hear from you all!!! ENJOY!!! 5. Meandering Paw Prints Over the Rainbow Bridge, collaboration with Doug Speeckaert of Dot's Closet. 9. 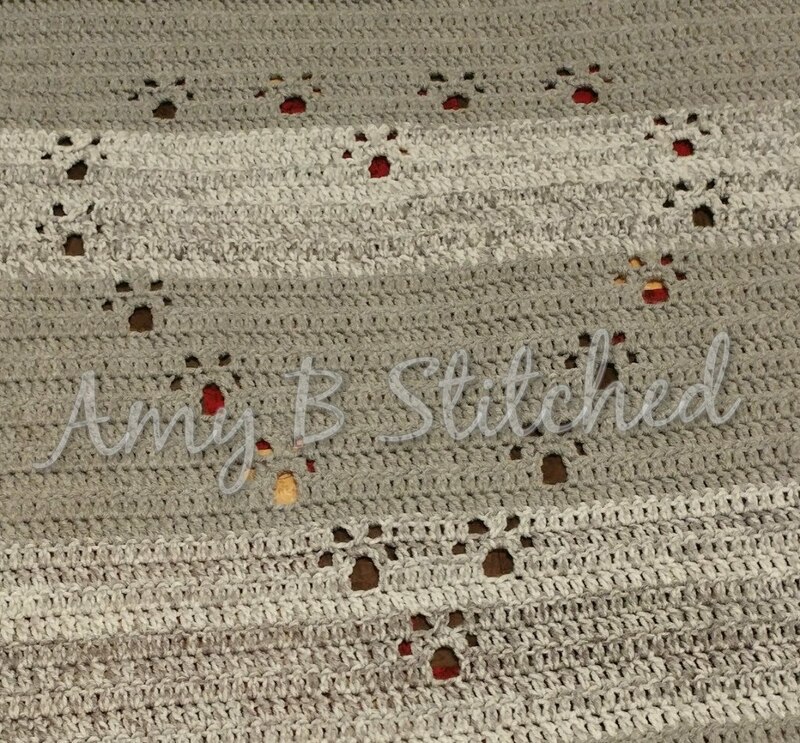 Meandering Paw Prints Heart of Duchess, Collaboration with Doug Speeckaert of Dot's Closet. No garden is complete without the creatures that spread the pollen to keep our flowers blooming and the honey flowing. Rows of Butterfly Wings and a panel of Honeycomb Mesh make this wrap a Gardener’s delight!! 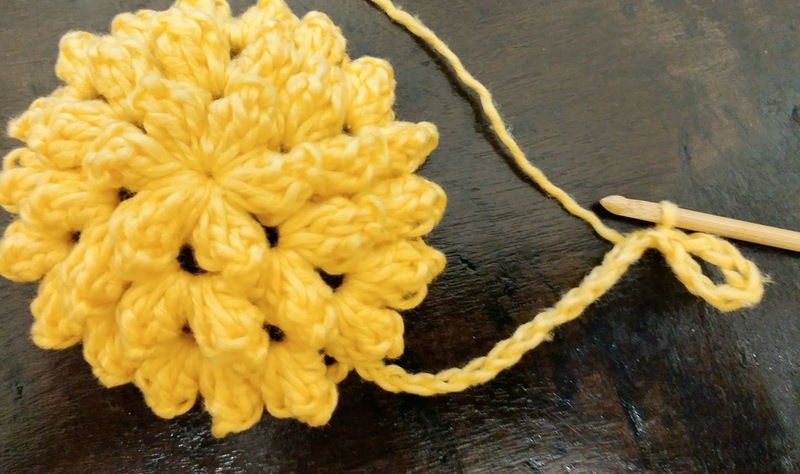 I grew up in a home with crochet AND gardening. So combining the two seems like a natural thing to me. I hope you enjoy this Wandering Wings series as much as I have enjoyed designing it!! If you want to see more of my designs in the future, you can subscribe to this blog by submitting your email address in the "follow by email" block on the right side of the screen (make sure you are in desktop or web view, not mobile). Once you submit, check your email. You MUST verify this email BEFORE you receive anything else from me!! 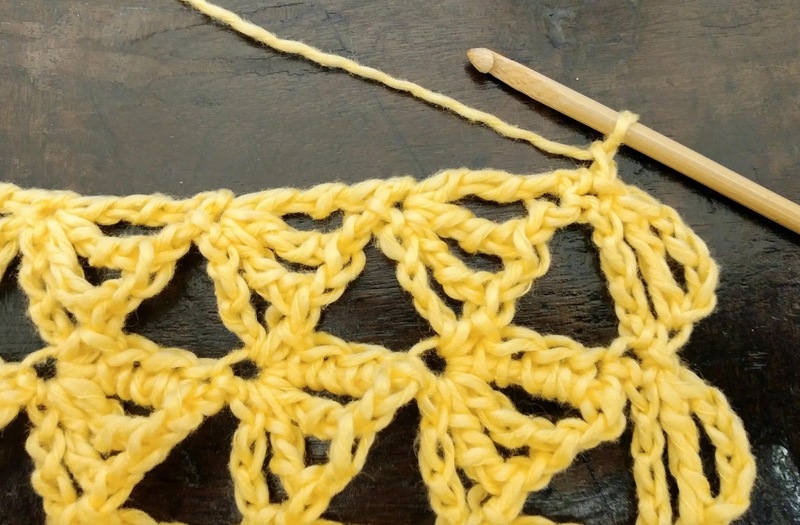 A lot of hard work goes into writing patterns. 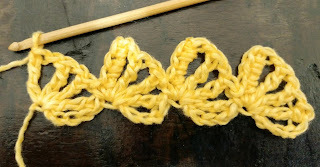 Please feel free to share the link to this blog, but DO NOT copy and distribute this pattern by any other means. SIZE: 66 inches wide x 16 inches tall. Size adjustment instructions can be found in the foundation row. MATERIALS: 8.75 oz (735 yards) Trigo by Omega (size 3/light worsted/DK) 100% Mercerized Cotton, size F/5/3.75mm crochet hooks, and yarn needle. 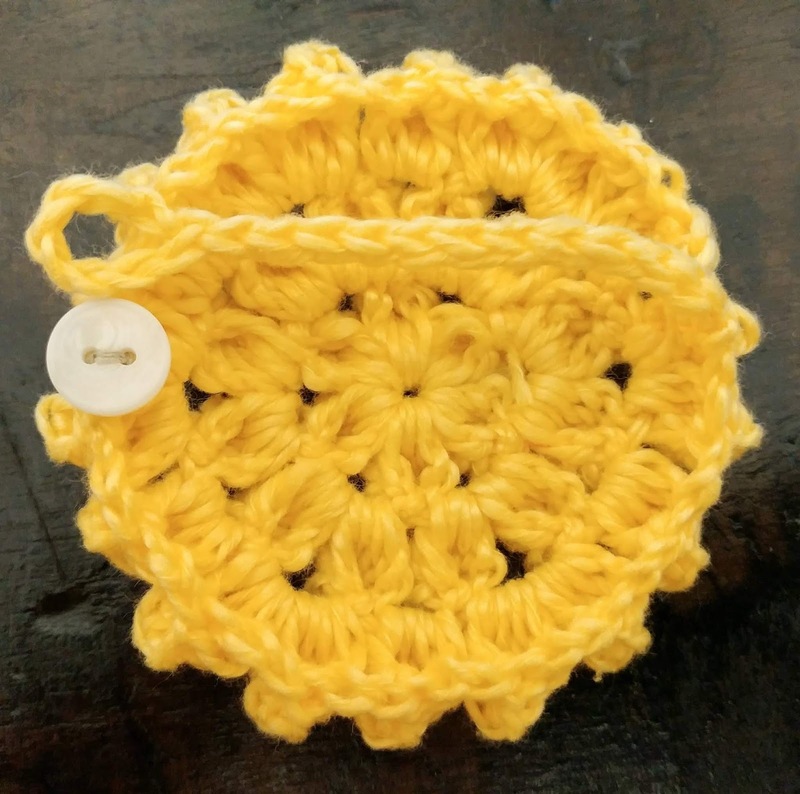 GAUGE: Swatch in pattern format. Foundation row (4 times) and rows 1-8 = 4 inches wide and 4 ½ inches tall. Foundation Row: * Ch 5, trc in 5th ch from hook. Repeat from * 59 more times. 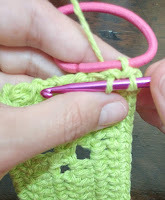 (Total of 60) (figure 1) To make your shawl larger or smaller, simply eliminate or add by 3’s. Essentially, the total number should be divisible by 3. 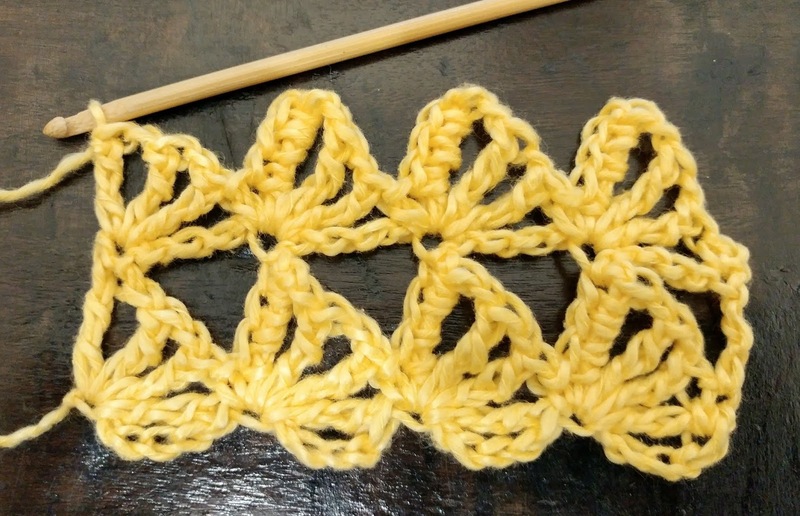 Rows 4-8: Repeat rows 2 & 3, ending with row 2. 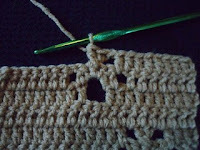 Row 12: Ch 3, turn. Dc in next sp. * Ch 3, dc in next ch 3 sp. Repeat from * across until your reach the beg ch 6 from previous row. Ch 3, dc in ch 6 sp. Dc in 3rd ch of beg ch 6. 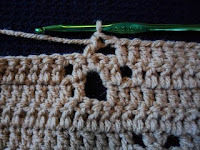 Row 13: Ch 6, turn. * Dc in next ch 3 sp, ch 3. Repeat from * across until you have 2 sts remaining at end of row. Sk next st. Dc in last st. Rows 14-22: Repeat rows 12 and 13, ending with row 12. 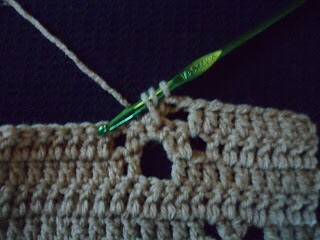 Row 24: Ch 1, turn. Hdc in each st across. Row 26: Turn. Sc in top of last trc made. * Ch 4, sc in first sc of next wing. Repeat from * across to top of last wing. Ch 4, trc in last sc of previous row. 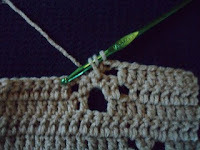 Row 27: Ch 1, turn. Sc in top of trc. * (Trc, ch 1) 3 times in next sc. 4 sc down the side of trc just made with the last sc being in the base of the st. Repeat from * across, DO NOT sc down the side of the last trc. 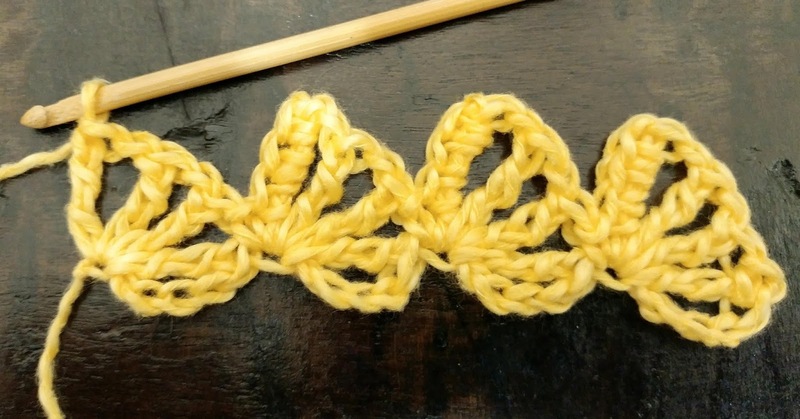 Rows 28-32: Repeat rows 26 and 27, ending with row 26. EDGING: Turn, *ch 5, trc in 5th ch from hook (see figure 7), sl st in next sc (see figure 8). Repeat from * across. Ch 1, working down side of wrap, ◊ sc in end of each sc row, 3 sc in the end of each trc row (see figure 9 and 10). Repeat from ◊ across. Finish off. 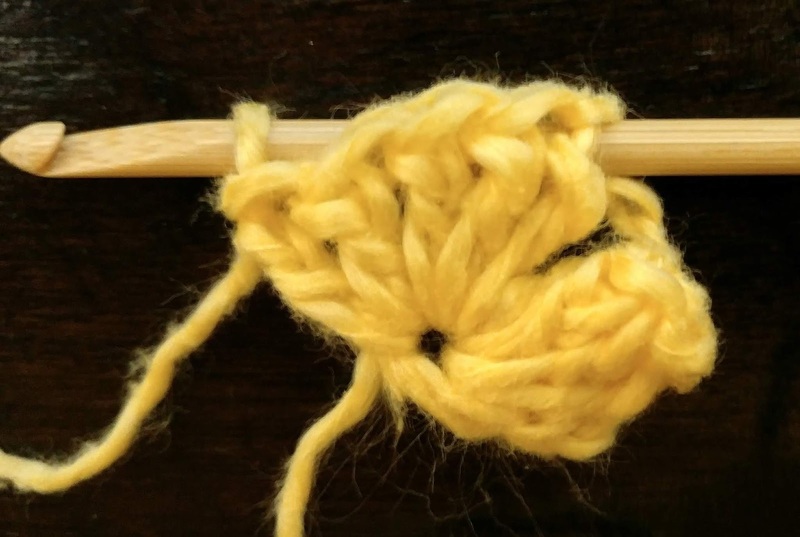 Reattach yarn to other side of wrap (see figure 11) and work up the other side from ◊ across. 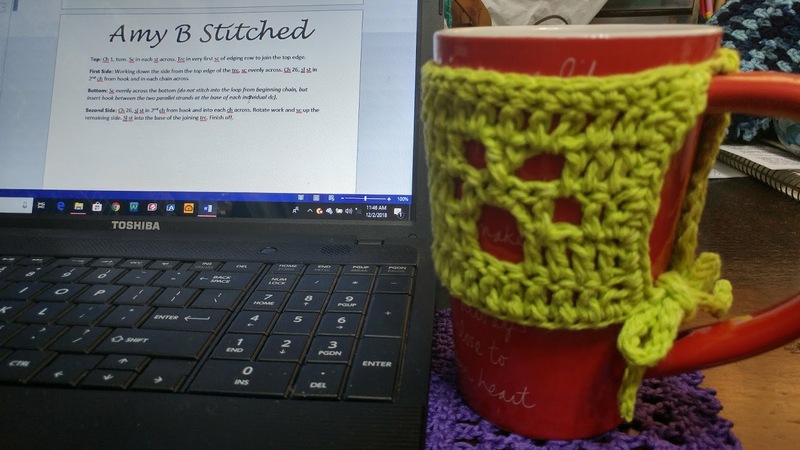 A lot of hard work goes into each pattern I write. 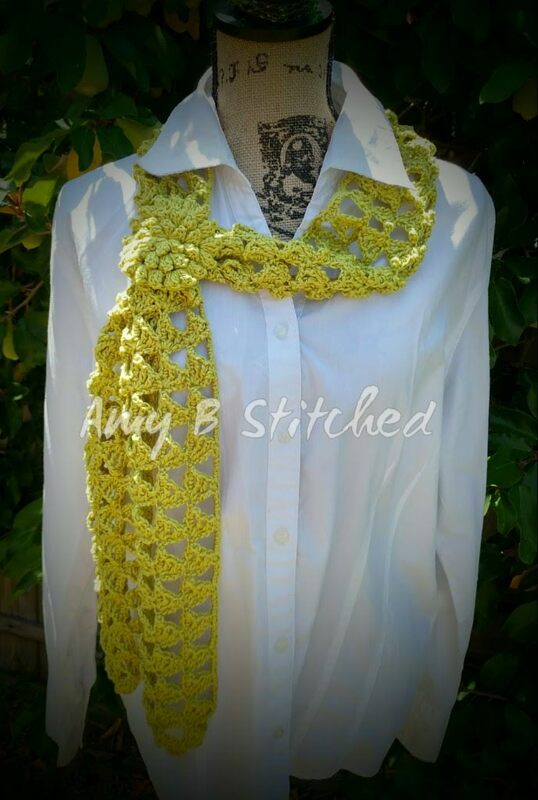 Please feel free to make finished items for profit. 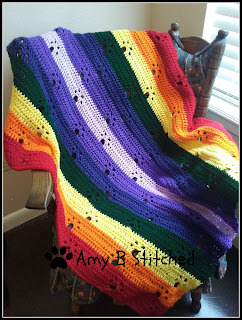 You are welcome to share the link to the Blog Post, but DO NOT copy and distribute this pattern without express written permission from Amy B Stitched. 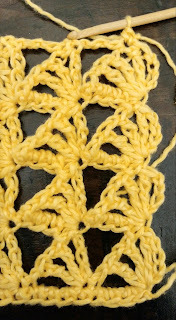 This is the first pattern in my newest series of patterns "Wandering Wings" and "Garden Jewels". 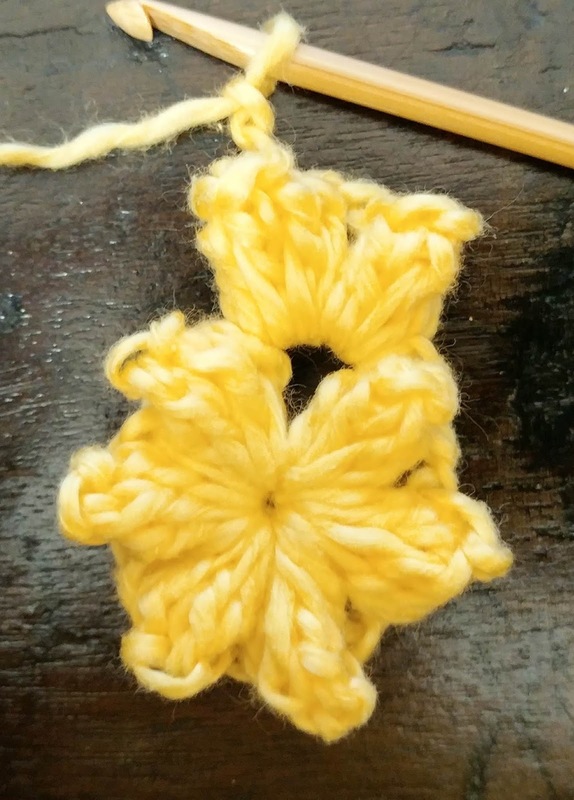 Last year I was playing around with a random ball of yarn and found at the end of my hook what appeared to resemble a butterfly wing. It was the beginning of Winter, which meant I was up to my eyeballs in already planned Christmas gifts. So I tucked it away, only to have it resurface on my radar just recently. 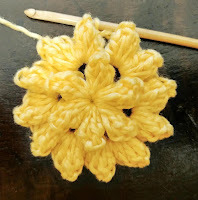 My work scheduled has lessened and this new design REALLY began to take shape! 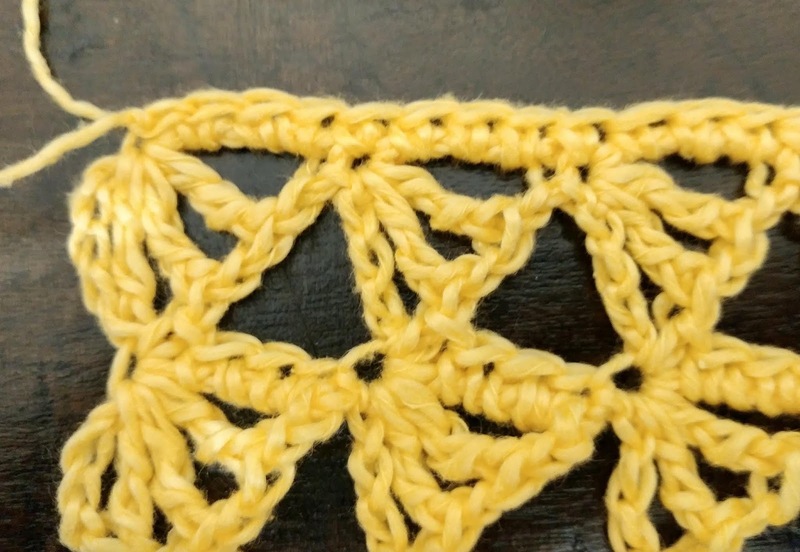 The stitches in this scarf do not lay flat. There is a sort of "lift" of each wing that makes it appear that the wings are in motion!! Because of this, it is not necessary to block this scarf...but if you choose to do so, it will not make it any less beautiful. 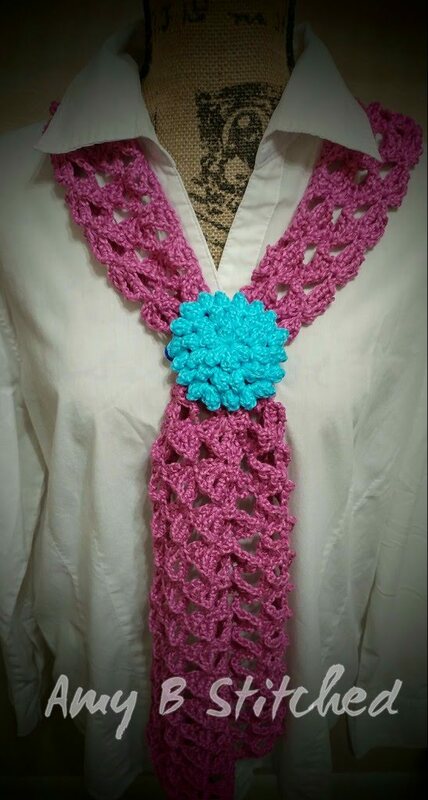 But the scarf was not complete by itself. It needed something to tie it all together. With Fall just around the corner I began to think about the Mum. A staple for the fall garden and of course for all the Homecoming Corsages!! But why name it Garden Jewel?? Because flowers are the JEWEL of the garden!! 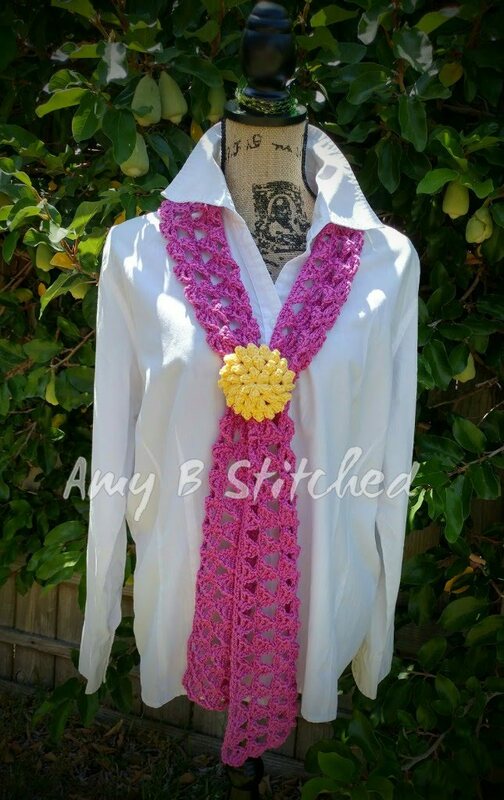 It connects to your scarf by a lovely little strap and button closure so that you can change out the colors or use it on a different scarf all together. 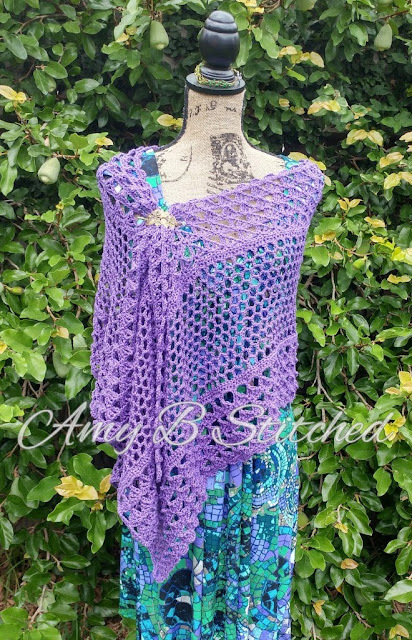 MATERIALS: 2.6 oz (218 yards) Trigo by Omega (size 3/light) 100% Mercerized Cotton, size F/5/3.75mm crochet hooks, and yarn needle. Repeat rows 2 & 3 to desired length ending with row 2. (I think 53 rows of butterflies is a good length for me as I like longer scarves). EDGING: Turn, *ch 5, trc in 5th ch from hook (see figure 7), sl st in next sc (see figure 8). Repeat from * across. Ch 1, working down side of scarf, ◊ sc in end of each sc row, 3 sc in the end of each trc row (see figure 9 and 10). Repeat from ◊ across. Finish off. 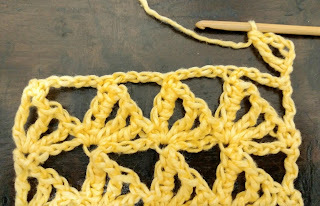 Reattach yarn to other side of scarf (see figure 11) and work up the other side from ◊ across. 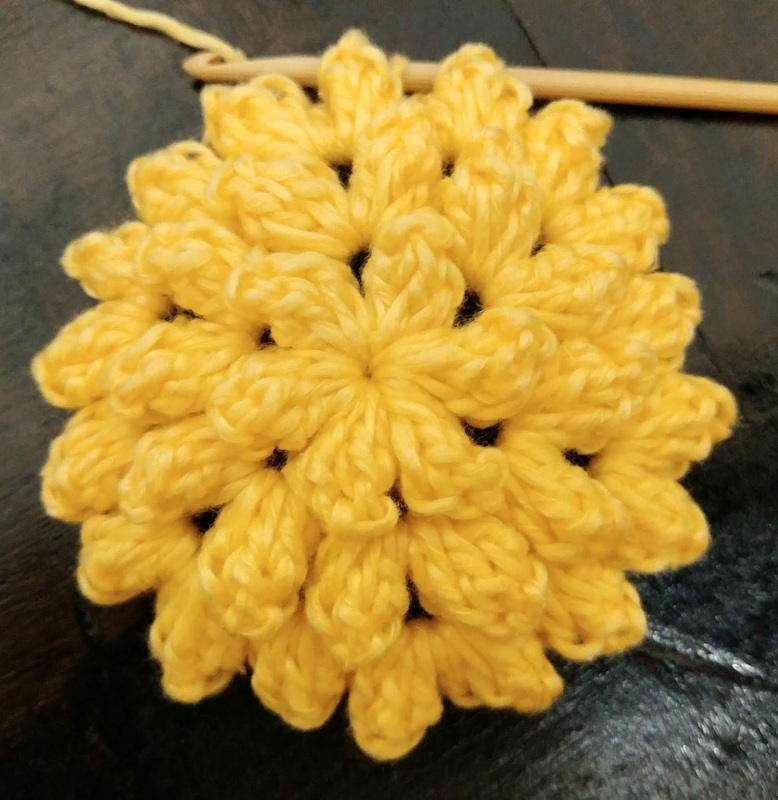 MATERIALS: Approx 20 yards of Trigo by Omega (size 3/light worsted/DK) 100% Mercerized Cotton, size E/4/3.5mm crochet hooks, small button, sewing thread and needle. GAUGE: not important, but you will want to stitch tightly so that your Mum holds its shape. • Beg pc – beginning popcorn stitch: Ch 3, 4 dc in same sp, remove hook from last st and place in top of beg ch 3, pick up dropped loop and draw through top of beg ch 3 st.
• Pc – popcorn stitch: 5 dc in same sp, remove hook from last st and place in top of 1st dc, pick up dropped loop and draw through 1st dc. Rnd 3: Sl st in next ch 2 sp. (Beg pc, ch 2, pc, ch 2) in same sp. * (Pc, ch 2) in next ch 2 sp, (see figure 6) ** (pc, ch 2, pc, ch 2) in next ch 2 sp. Repeat from * around ending at **. Sl st in beg pc to join. (18 pc, see figure 7) DO NOT FINISH OFF. BUTTON LOOP: Ch 19. Sl st in 7th ch (see figure 8) from hook and in each ch remaining. Sl st in beg pc on last row of mum. Finish off. 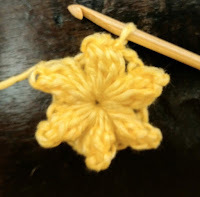 With needle and sewing thread, stitch the button to the back side edge of the final row directly across from where the button loop originates (see figure 9). 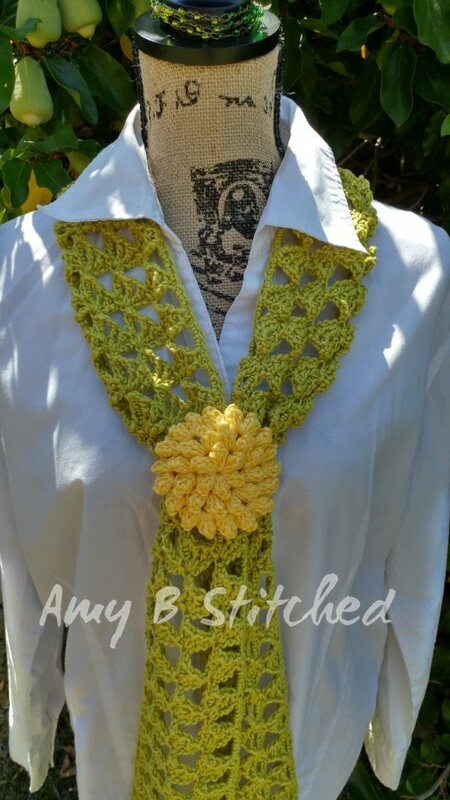 Garden Jewels Mum pattern is an Original Design by Amy B Stitched. A lot of hard work goes into each pattern I write. Please feel free to make finished items for profit. 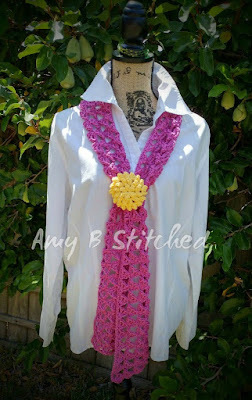 You are welcome to share the link to my blog www.amysastitchatatime.blogspot.com, but DO NOT copy and distribute this pattern without express written permission from Amy B Stitched. THANK YOU!! 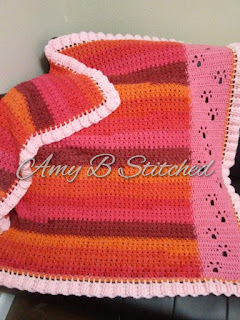 All patterns published on this blog are the property of Amy Brewer. . Simple theme. Powered by Blogger.